Stayer easily wins Avondale Cup at Ellerslie while Puccini grabs Avondale Guineas. 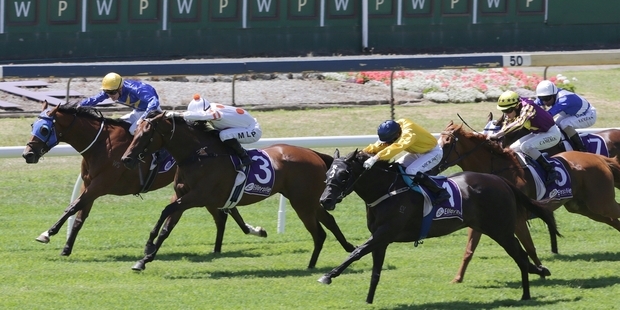 Silent Achiever (outer, gold silks, blue cap) wins by a hair's breadth at Ellerslie on Saturday. He may not be rushing to tell you, but Mark Oulaghan is a $1.10 chance to have seen something in Who Shot Thebarman he hadn't previously seen in Saturday's $100,000 Go Racing Avondale Cup. Oulaghan may have suspected it, but he, like the rest of us, had not had it thrust before his eyes. That is how good this rising stayer actually is and how easily he won Saturday's feature at Ellerslie. This was no ordinary win - this was something very special. To get to open class, much less Avondale Cup grades, in seven starts is a remarkable achievement, but to be turning into the home straight after 2000m with the rider trying to make him go slower while the rest of the field is being scrubbed up is even more remarkable. It's something you just don't see these days. To see how strongly Who Shot Thebarman was travelling under Matt Cameron at the 700m was jaw-dropping and the two and a half length winning margin could have been doubled. This is an extraordinary stayer who, frighteningly, mainly for the opposition, is going to get better. In the Winners' Circle bar at Ellerslie on Saturday you suggest to Oulaghan that we'd all just seen something out of the ordinary and he brought out one of his shy smiles and said quietly: "Yes, he's pretty good, isn't he," which could have been most other trainers gushing "this could be a Melbourne Cup horse". Mark Oulaghan is New Zealand's Bart Cummings, even though Bart hardly had time to devote to preparing jumpers, which Oulaghan has often specialised in. Oulaghan works his horses extremely hard and if the eating patterns and level of condition show the horse can cope with that, he might just work that horse a little harder again. That's rule No1 out of Bart's training manual. The name. Well, Wanganui's O'Leary brothers explain that as Irishmen, they perhaps are not strangers to a tipple. When the barman is slow, they say, you've always got to shout out: "Who shot the barman". The TAB certainly didn't miss the race - Who Shot Thebarman is now into $3 favourite for the Auckland Cup with Celtic Prince at $8 the only other runner under double figures. Who Shot Thebarman is versatile and has won races on heavy tracks. As someone said immediately after Saturday's Cup: "It wouldn't matter if it was wet [on Cup day]". Or if they put up eight hurdles around Ellerslie. One of the questions we were left with on Saturday is whether the racing pattern of the Derby will mirror what we saw at Ellerslie this weekend. Puccini provided a no-arguments win in the $100,000 Auckland Eye Avondale Guineas on a day when on-pace runners had an advantage because of the rail being so far out. Make no mistake, this is not making excuses for Puccini's opposition - we have continually underestimated Puccini and he has continually made us all pay. But 2400m of a Derby with the rail back in will be a different race. It will be a fascinating race. Runner-up Rising Romance will improve and third-placed Glorious Lad is still in contention, but, as trainer Shaune Ritchie says: "He's got a lot of ground to make up on the other pair." The luck that has often eluded Silent Achiever since she won the Derby can come flooding in the next six weeks. The mare's matchstick-thin but brilliant win at Ellerslie on Saturday is likely to be followed by the New Zealand Stakes rather than the Australian Cup then Sydney's Ranvet, BMW and Sydney Cup. She will take plenty of beating in all of those. The disappointment of the Caulfield Guineas faded for New Zealand trainer Trent Busuttin when El Roca made his first visit to Sydney a winning one. The colt was an unlucky fifth in the Guineas won by Long John last spring but showed he would be a force this time around with a stylish victory in Saturday's Listed Eskimo Prince Stakes. The 1200m race is the first of three planned races with the Hobartville (1400m) the next step before the Group One Randwick Guineas (1600m) on March 15. Ridden by Hugh Bowman who steered the Busuttin-trained Sangster to win the 2011 Victoria Derby, El Roca, the $2.50 favourite, gathered in the leaders and stretched out to beat Dissident ($3.40) by two lengths with Romantic Touch ($16). "I know how good he is but you like to see them do it especially over here," Busuttin said. "He didn't get his chance in the Caulfield Guineas.